Parking was a nightmare so we gave up and found a garage. I found my friend Robyn amidst the 21,000+ people and we made our way to the starting line for the 8k. I am VERY happy that the weather turned out nice today! No rain. The sun was out, but it was pretty cold. 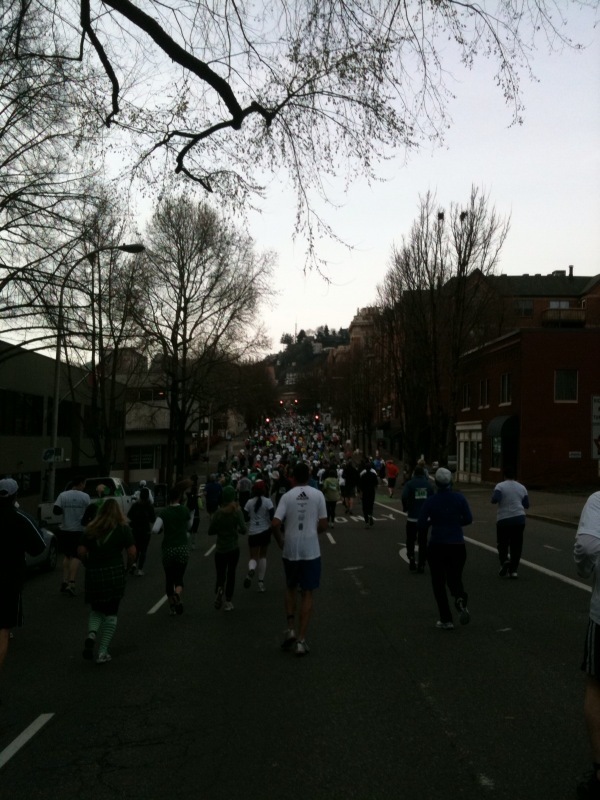 There were a LOT of people there for the 8k so our start was pretty slow. I felt stiff for the first mile but started to warm up after that. 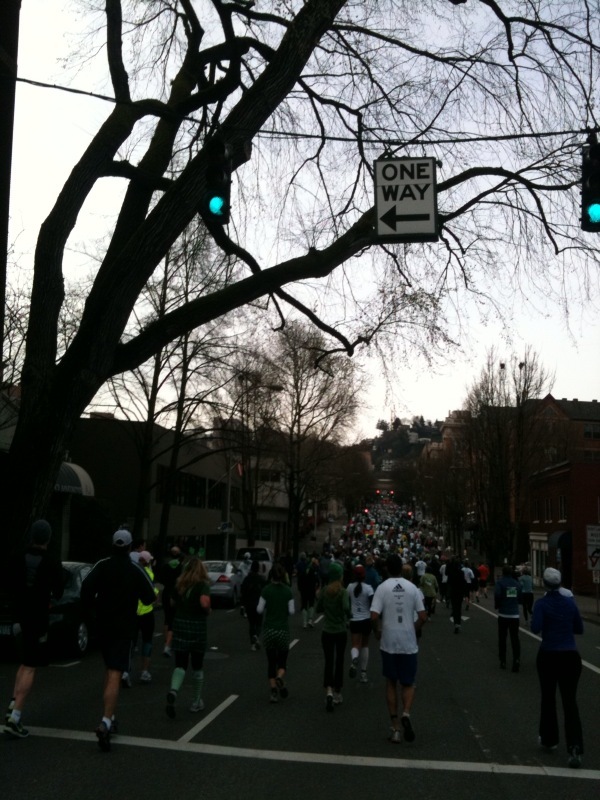 We ran up Burnside and turned onto Broadway. I tried to take a few pictures during the run but they didn’t really turn out great. Sorry. 🙂 I was feeling pretty good with my pace. I saw a few people trip and fall but they seemed okay. One girl fell right in front of me and I helped her up but she wasn’t scraped up too badly. 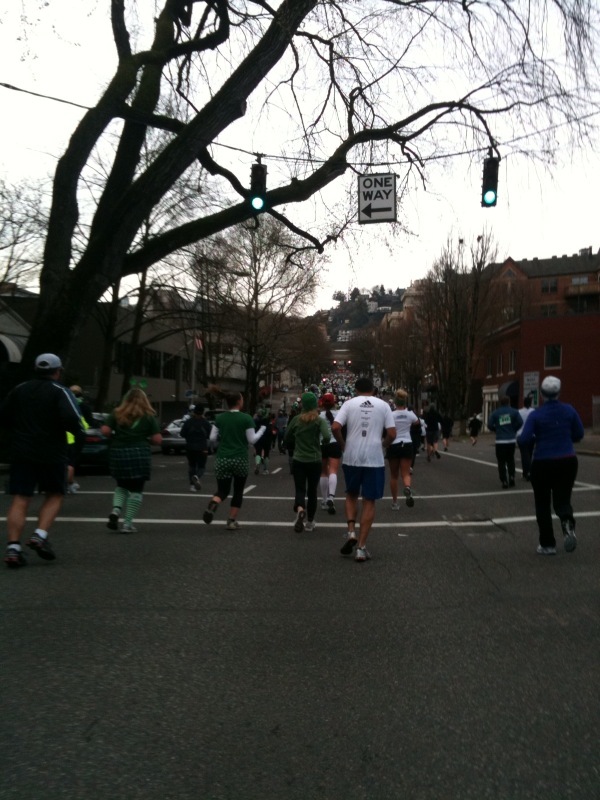 After turning onto Broadway it was uphill the rest of the way to Terwilliger. Ooof! It was okay though. My heart rate monitor said I was peaking at about 190 beats! Yikes! But my legs were doing okay so I didn’t walk. It leveled out and I felt some relief for about a mile. I was excited that I had gone as far as I had without feeling like I needed to walk at all. Turning from Terwilliger we headed back to Naito Parkway. I could see the finish line and it was all downhill! The last mile was where I started to hurt a bit. My ankles and feet weren’t too happy but they weren’t screaming at me either, so that’s good. 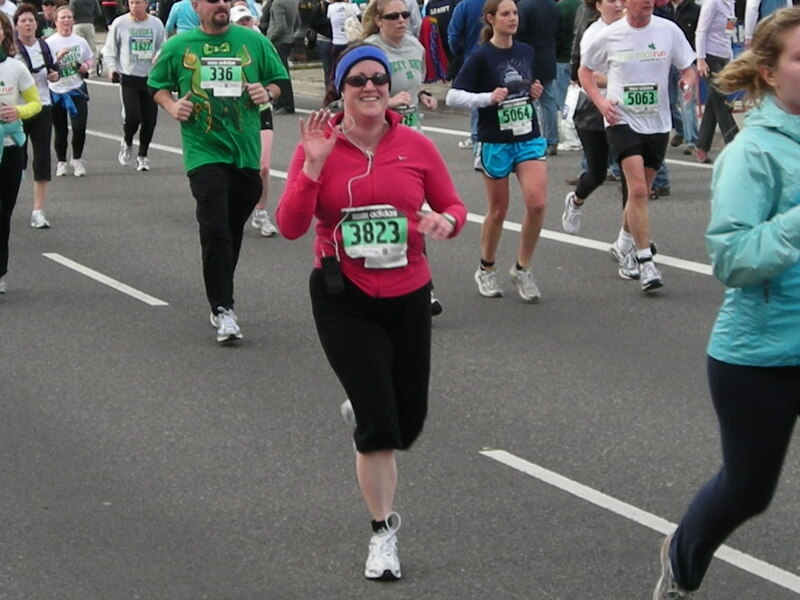 A few yards from the finish line I started to sprint. I saw Michael on the side cheering for me and taking my picture! That gave me the extra little push to run as HARD AS I COULD! I crossed the finish line in 53 minutes and didn’t walk at all!!!!!!!!! It was hard to make my way through the crowd to where I was supposed to meet Michael but I finally did. I was choked up with emotion when I saw him. I gave him a hug, he kissed me and I felt so relieved that I had finished. 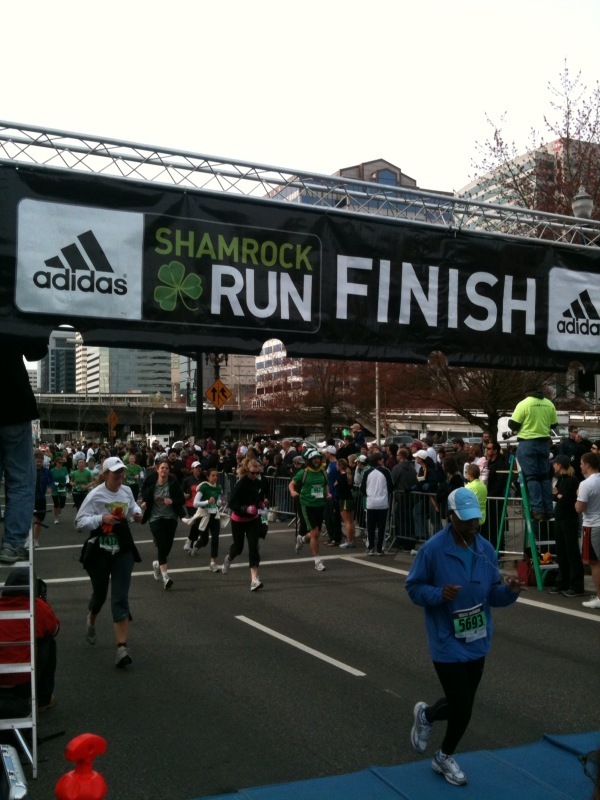 It was a great feeling having reached my goal: completing the race without walking. This is a wonderful accomplishment, Lisa! Congratulations. Congratulations!! I can't remember how I found your blog but I've been reading (and enjoying!) for a few weeks now. Way to go on that race! Sorry it took me so long to read your race recap! First of all, CONGRATULATIONS!!! The 5k was tough, so you are officially my HERO for finishing the 8k (and without walking? AMAZING!). You are going to ROCK Hood to Coast this year!! !